Participants of all ages enjoy the Christmas decorations donning Spring Street before crossing the finish line at the 2017 It’s a Wonderful KLIFE fun run. 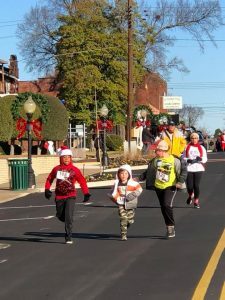 Searcy KLIFE will host its Fourth Annual “It’s a Wonderful KLIFE” 5K/1M fun run on Saturday, Dec. 8, in Downtown Searcy. The run will start at 9:30 a.m. in front of the historic Courthouse Square. KLIFE Board President Richard Stafford said the fun run, inspired by a beloved Christmas movie, will correspond with Searcy’s Holiday of Lights festivities. The fun run is for people of all ages and activity levels with trophies and medals for multiple age groups. A non-denominational Christian ministry, KLIFE offers discipleship and fellowship for local youth from fifth through 12th grades. Activities include weekly club meetings, small group Bible studies, monthly events and mission trips. The ministry even offers one-on-one mentoring for students to provide them with extra encouragement. To register for the “It’s a Wonderful KLIFE” Fun Run, call 501.593.3666 or sign up at racesonline.com/events/it-s-a-wonderful-klife. Connect with KLIFE on Facebook, Instagram and the organization’s website at searcy.klife.com.